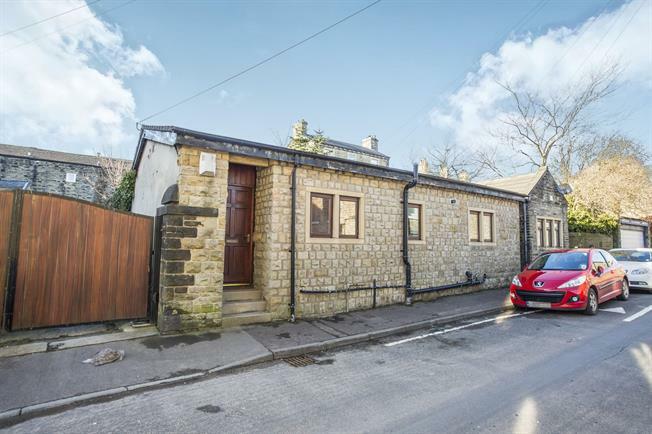 3 Bedroom Detached Bungalow For Sale in Halifax for Offers in the region of £150,000. A stunning and deceptively spacious stone built detached true bungalow which is located in this highly sought after residential area and placed within approximately 100 metres from the beautiful Savile Heath Park, briefly comprising a good size kitchen diner, large lounge, 2 double bedrooms and 1 single bedroom and a 5 piece family bathroom. Externally the property boasts a private and secure rear lawned garden and patio area, together with additional land and with the added benefit of 2 garages and further off street parking for multiple vehicles. The property is in need of some modernisation and is priced to reflect this. This property would make an ideal family home and an internal inspection is highly recommended. Wooden front door. Double glazed wood window facing the front. Double radiator, tiled and wood flooring, tiled splashbacks, painted plaster and beam ceiling with downlights. A range of wall and base units with complementary work surface, one and a half bowl sink with mixer tap and drainer, space for oven and hob with over hob extractor, space for dishwasher and washing machine. Wooden French double glazed door opening onto the garden. Double glazed wood window facing the rear overlooking the garden. Gas fire and double radiator, wood flooring, painted plaster ceiling and wall lights. Double bedroom with double glazed wood window facing the rear overlooking the garden. Double radiator, carpeted flooring, painted plaster ceiling and ceiling light. Double bedroom with double glazed wood window facing the front. Double radiator, carpeted flooring, painted plaster ceiling and ceiling light. Single bedroom with double glazed wood window facing the rear overlooking the garden. Double radiator, carpeted flooring, beam ceiling and ceiling light. Double glazed wood window facing the front. Radiator, vinyl flooring, part tiled walls, painted plaster ceiling and ceiling light. Low level WC, panelled bath with mixer tap, single enclosure shower, pedestal sink and bidet.